An eraser is a object that is used to remove marks from paper. Most erasers are designed to remove pencil marks. Other erasers are designed to be used on typewriter marks. Some special pens contain erasable ink that can be removed by erasers. While some erasers are sold separately in the form of wide, slender blocks, many more erasers are found permanently attached to pencils. Other erasers are made to temporarily attach to pencils. Some erasers are enclosed in wooden cases that resemble pencils. These erasers, designed to be sharpened like pencils, often have a brush attached. This is used to brush away small pieces of the eraser left behind after it removes a mark. This type of eraser is usually used to remove typewriter marks. The first erasers were pieces of bread. There was no better substance for removing pencil marks until rubber was available in the Old World. Rubber was known to the inhabitants of Central and South America long before Europeans came to the New World. As early as the eleventh century, it was used to coat clothing and to make balls. It was also used to make footwear and bottles by pouring the liquid form on earthen molds and allowing it to dry. In 1735, the French scientist Charles de la Condamine described a substance known as caoutchouc and sent samples to Europe. Caoutchouc was derived from a fluid produced under the bark of a tree found in tropical areas of the New World. This milky liquid, known as latex, is still used to make natural rubber. Caoutchouc was first suggested for use as an eraser in the Proceedings of the French Academy in 1752, probably by Jean de Magellan. In 1770, the English scientist Joseph Priestley suggested that caoutchouc be named rubber, because of its ability to rub away pencil marks. He also told readers of his book Familiar Introduction to the Theory and Practice of Perspective where to purchase "a cubical piece, of about half an inch, for three shillings." In the United Kingdom, erasers are still known as rubbers. Until the late nineteenth century, pencils and erasers were always separate. In 1858, Hyman Lipman of Philadelphia patented a pencil with a groove in the tip, into which an eraser was glued. By the early 1860s, the Faber company made pencils with attached erasers. In 1862, Joseph Rechendorfer of New York City patented an improvement of Lipman's design and sued Faber. The United States Supreme Court determined that the idea of combining a pencil with an eraser could not be patented. The reason for this decision was the fact that combining the pencil and the eraser did not change the function of either. This decision opened the way for numerous companies to make pencils with erasers. In 1867, a hollow eraser, into which a pencil could be inserted, was invented by J. B. Blair of Philadelphia. Earlier versions are also known to have existed. In 1872, the Eagle company made pencils with erasers inserted directly into the wooden case of the pencil. Other companies soon made similar pencils, which became known as penny pencils because they were inexpensive. The availability of pencils with attached erasers in schoolrooms was at first controversial. It was believed that the ability to correct errors easily would make students careless. Despite this concern, pencils with erasers were extremely popular. About 90% of modern American pencils are made with attached erasers. Pencils without erasers are somewhat more common in Europe. The most important raw material in an eraser is rubber. The rubber may be natural or synthetic. Natural rubber is obtained from latex produced by the rubber tree (Hevea brasilienesis). Synthetic rubber exists in a wide variety of forms. The most common synthetic rubber is derived from the chemicals styrene and butadiene. Styrene is a liquid derived from ethylbenzene. Ethylbenzene is usually made from ethylene and benzene, both of which are derived from petroleum. Butadiene is a gas, derived either directly from petroleum or from substances known as butanes and butenes, which are derived from petroleum. Other ingredients added to rubber include pigments that change the color of the eraser. White can be produced with zinc oxide and titanium oxide. Red can be produced by iron oxide. Many other colors can be produced with various organic dyes. An important ingredient added to almost all rubber is sulfur. Sulfur allows rubber to be vulcanized. This process was invented by Charles Goodyear in 1839. It uses heat and sulfur to make rubber more durable and resistant to heat. Various other ingredients may be added to rubber. These include vegetable oil, to make the rubber softer and easier to shape, and pumice, a natural mineral which makes the eraser more abrasive. 1 Rubber tree plantations are found only in tropical regions with high levels of annual precipitation. Malaysia is the leading producer of rubber trees. A rubber tree is tapped by cutting a thin strip of bark about 0.04 in (1 mm) deep off the tree as high up as the worker can easily reach. Later strips will be cut below the first one. Each strip reaches about halfway around the circumference of the tree and slants downward at an angle of about 30 degrees to allow the latex to drain into a container. If the latex is allowed to coagulate naturally, each cut will produce about 1 oz (28 g) of latex before the latex stops flowing after a few hours. A chemical may be applied to the bark to prevent the latex from coagulating, allowing it to flow for several days. 2 The collected latex passes through a sieve to remove foreign objects. Water is added to the latex and the mixture is pumped into large horizontal tanks containing aluminum partitions. Dilute acetic acid or formic acid is added to make rubber coagulate into slabs on the partitions. The slabs are sprayed with water while they pass through a series of rollers. Excess water is removed by another series of rollers. The slabs are packed in bales, usually weighing 225-250 lb (102-113 kg), in the shape of cubes about 2 ft (60 cm) on each side. The bales are coated with clay to prevent sticking, bound with metal straps, and shipped to manufacturers. 3 Depending on what kind of synthetic rubber is being made, a wide variety of manufacturing processes may be used. The most common form of synthetic rubber, styrene-butadiene rubber, is usually made in an emulsion process. 4 Various chemicals are obtained from petroleum by fractional distillation. This process involves heating petroleum to about 600-700° F (315-370° C) and allowing the vapor to pass through a tall vertical tower. As the vapor rises through the tower, it cools. Chemicals with different boiling points change from gas to liquid at different points inside the tower and are collected. Chemicals with very high boiling points remain in the liquid state when the petroleum is heated and can be removed from the bottom of the tower. Chemicals with very low boiling points remain in the form of gases and can be removed from the top of the tower. Erasers are made from either natural or synthetic rubber. Natural rubber is produced from latex that is collected from rubber trees. Water is removed from the latex, increasing the rubber content to 60%. 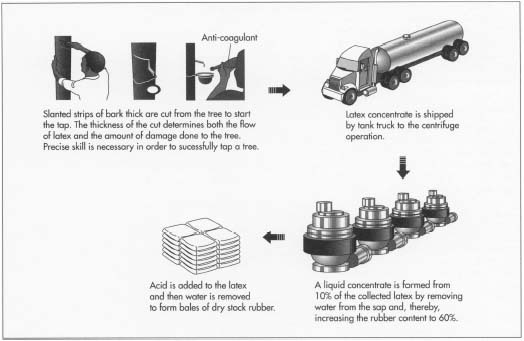 Acid is added to the liquid concentrate in order to produce solid sheets of dry rubber. 5 Other chemicals are obtained by catalytic cracking. This process involves heating petroleum to about 850-900° F (454-510° C) under pressure in the presence of a catalyst. The catalyst causes chemical reactions to take place. The new mixture of chemicals are then separated by fractional distillation. 6 Styrene and butadiene are obtained by subjecting certain chemicals derived from petroleum to various chemical reactions. The styrene is a liquid under normal conditions, but the butadiene is a gas and must be stored under pressure to keep it in a liquid form. 7 The two liquids are pumped into a container and mixed with water, soap, and a catalyst. The catalyst causes the styrene and butadiene to react to form particles of synthetic rubber. The soap causes these particles to be dispersed in the water in a smooth emulsion. Constant agitation keeps the rubber particles from settling out. 8 Other chemicals added to the mixture include stabilizers, which prevent the rubber from breaking down, and modifiers, which change the properties of the rubber. Another chemical is added to stop the formation of rubber particles at an optimum point. Unconverted styrene and butadiene are removed and are reused. A coagulant is added to the emulsion, causing the synthetic rubber to be deposited. Styrene-butadiene rubber is generally shipped to manufacturers in bags made of polyethylene plastic, each holding 75 lb (34 kg) of rubber. 9 Rubber arrives at the eraser factory and is mixed with pigments, vegetable oil, pumice, sulfur, and other ingredients that modify the properties of the final product. Synthetic rubber is easier to mix because it usually arrives as a powder or a liquid. Natural rubber usually arrives in bales and must be pulverized into powder or dissolved in a solvent before it can be mixed. Once the natural or synthetic rubber is mixed with pigments, vegetable oil, pumice, sulfur, and other additional ingredients, the mixture is heated and the erasers are formed. In order to make eraser plugs that will be attached to the ends of pencils, the rubber mixture is extruded and cut into plugs. To make flat, rectangular erasers, the mixture is injected into molds and then cooled. 10 The mixture is heated, causing the sulfur to vulcanize it, making it more stable. 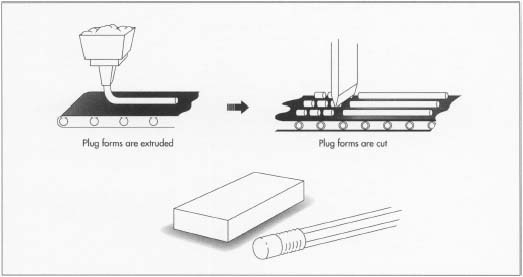 To make plugs, which will be attached to pencils, an extrusion process is usually used. The mixture, in the form of a soft solid, is forced through a die to form a long cylinder. The cylinder is repeatedly cut as it emerges, forming plugs. 11 To make flats, which are not attached to pencils, an injection molding process is usually used. The mixture, in the form of a warm liquid, is forced into molds and allowed to cool into a solid. The flats are then removed from the molds. 12 Plugs are shipped directly to pencil manufacturers. They are attached to pencils by small, cylindrical, metal cases known as ferrules. Ferrules are made of plain aluminum for less expensive pencils, or painted brass for more expensive pencils. The ferrule is attached to the pencil with glue or with small metal prongs. The plug is inserted into the ferrule and clamped around it. 13 Flats may be marked with the name of the manufacturer or other markings. This may be done by stamping—pressing an inked stamp on the eraser. It may also be done by screen printing—moving an inked roller over a patterned sheet of silk or another material which covers the eraser. Three-dimensional markings can be made by embossing—cutting into the eraser with a sharp die. The completed flats are packed into cardboard boxes and shipped to retailers. The manufacturing of erasers is highly automated, with reliable products made in the millions each year. Experienced eraser manufacturers have refined the techniques used to the point where extensive inspection is not necessary. The raw materials shipped to the manufacturer are supplied by companies that are known to provide substances with the proper characteristics. If a new substance is supplied, or if it comes from a new company, the eraser manufacturer may inspect it to be sure it meets all specifications. Only a very small percentage of erasers need to be inspected to ensure that they have the proper physical properties. Flats must be the correct size to fit into boxes. Plugs must have the correct dimensions to fit into ferrules. The hardness of erasers is critical to how well they will work. Experienced inspectors can easily tell if an eraser is too hard or too soft. Erasers have remained mostly unchanged for many years. Improvements in eraser technology are likely to be made in the way rubber is produced. New chemical formulas are constantly being developed to produce synthetic rubber in ways that are more efficient, less costly, and which result in products with more useful properties. Genetic engineering may result in rubber trees that produce more latex, or trees that produce latex with physical properties that would make natural rubber production more efficient. A hint of the future of eraser design is seen in the Ergoraser, a unique eraser from Levenger, a company specializing in very high quality writing supplies. The Ergoraser, developed after two years of research, is oval and curved, much like the shape of a spoon. The thumb fits inside the curve during use in a way which is designed to be comfortable and efficient. Although extremely expensive compared to ordinary erasers, the Ergoraser promises to play an important role in the future for those who demand the highest quality in simple objects. Petroski, Henry. The Pencil. Knopf, 1990. "Eraser Certification." http://www.wima.org/consumer/c-obcertprograms/eraserprog.html/ (February 17, 1998).